Read the profiles for each of the 32 nominees. 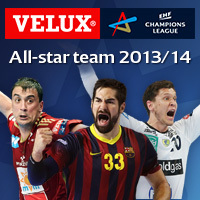 Voting has started to choose the best of the best: the VELUX EHF Champions League All-star team for the season 2013/14. For the second time in the men's European top flight, the season’s All-star team is going to be chosen by those who know best about just who has made the grade week in and week out: the fans. From a selection of 32 players, four in each position and also the season’s best defensive player, fans are being asked to choose their own All-star team. Players from 17 nations and 14 clubs in the current VELUX EHF Champions League season have been selected. The vote will be open until Wednesday 28 May 2014. The fans’ choice for the All-star team will be announced on the eve of the VELUX EHF FINAL4 in Cologne on 30 May 2014. Voting is open immediately and will run until Wednesday 28 May 2014. Fans can choose their VELUX EHF Champions League 2013/14 team online via the ehfCL.com website. The 24-year-old Dane is in the Löwen squad since the start of last season and is one of the main reasons for their success. The successor of legendary Kasper Hvidt broke through during the 2011 WCh. Gudmundur Gudmundsson was already his coach at his former club GOG – and he gave him the chance to be number one in Svendborg already at the age of 20. In 2012 he became EHF EURO champion in Serbia. One of the best Barcelona players for his incredible quality in goal and for the joy he brings to the team. The Bosnian goalkeeper won the Europe’s elite competition in 2011 with Barcelona, awarded the best goalkeeper of the Spanish league in 2011 and 2012. He joined Barca in 2009, after spells with multiple Spanish clubs, but began his career in Serbia with RK Crvena Zvezda and RK Sintelon. The Swede won the CL in 2007 with THW Kiel, where he played until 2008, before leaving Northern Germany for three years to join TV Großwallstadt. In 2011 he returned northwards, signing his contract in Flensburg and won the Cup Winners’ Cup that season as well as being awarded the Bundesliga’s best player. Andersson has vast international experience and won a silver medal at 2012 Olympics in London. Courtesy of his excellent skills, Serbia goalkeeper Darko Stanic, who joined Metalurg in 2011, is referred to as ‘Minister of Defence’ and immediately he won the hearts of the fans. At the end of the 2012/13 season Stanic was voted into the VELUX EHF Champions League All-star team, the same award he received at the end of the EHF EURO 2012 in Serbia, where he won the silver medal. Born in Mannheim, and a player at the club since 2003 he is the local hero for RNL. His talent was discovered very early and was awarded MVP at the Junior WCh in 2007, where he also won the silver medal. He was top scorer of the 2010/11 CL season. In November 2012 he tore his Achilles tendon, but right for the EHF Cup Finals in Nantes he was back helping Löwen to take their first title in history. Fast, faster, Eggert: The Dane had big shoes to fill in Flensburg as successor of the legendary Lars Christiansen. However, he coped perfectly with this situation and was the top scorer of the German Bundesliga in 2011 and top scorer of the 2013 World championship in Spain. Eggert, famous for being ice-cold from the penalty line, is a two-time EHF EURO champion (2008, 2012) with Denmark. After only one year away from the Bundesliga, the 2011/12 season was spent at AG København, Sigurdsson returned to Germany gain before the start of last season. After a number of oustanding performances in Europe, the Icelandic international really appeared to have rediscovered his joy for playing handball. With his enormous experience and equally large talent, 2008 Olympic silver medallist Sigurdsson is a key player. Vardar Skopje is just the second club in the career of Dibirov, his first club was Chekhovskie Medvedi, with whom he reached the VELUX EHF FINAL4 in 2010. At the 2013 World Championship the Russian international was voted best left wing of the tournament. In 2006 Dibirov, a fast break specialist and aggressive defender, won the Cup Winners’ Cup with Chekhov, beating CBM Valladolid in the final. The left back was the first Czech player to be World Handball Player of the Year in 2010. Jícha is a two-time VELUX EHF Champions League winner, in 2010 and 2012, and was twice top scorer of the competition as well. He is a danger to all defences, but is also a strong defender. Jícha was in the only active VELUX EHF FINAL4 participant on Ultimate Selection from 20 years of the EHF Champions League named in June 2013. The former World Handball player of the Year has stepped up to the expectation of Barcelona, after they signed him over the summer. Karabatic has already won everything there is to win, as he has triumphed at Olympic Games, World Championships and EHF EUROs with the French national team. The two-time CL winner is one of the most complete handball players ad is relied upon in both attack and defence. He joined the THW Kiel in 2009 from VfL Gummersbach and won seven titles during his four years with THW, including two CL titles. The Serbian left back led his country to their first handball medal as an independent nation at the EHF EURO 2012 and was selected as MVP of the tournament. His move to Veszprem has proven to be a success already, breaking his personal goal scoring record with 91 goals in Europe this season. Kielce’s powerful left back Michał Jurecki returned to Poland in 2010 after a three-season stint in Germany, which included spells as HSV Hamburg and TuS N-Lübbecke, and has been one of the club’s most consistent scorers since, and led his team in Europe this term with 58 goals. 28-year-old Jurecki reached the 2007 World Championship final with Poland and has made over 100 appearances for his country. In August 2011 his biggest fight started – not on, but off the court. After he was diagnosed with cancer, an immediate surgery and chemo therapy changed his life. The Norwegian international returned to the court just two and a half months after surgery. Hungarian side Veszprém was his first foreign club, before arriving in Nordhorn, where he became EHF Cup winner for the first time in 2008. Noddesbo started his career at Team Tvis Holstebro before joining KIF Kolding in 2004. Since then, he has been among Europe’s elite year after year – with Kolding from 2004 to 2007, and ever since with FC Barcelona, whom he joined in the summer of 2007. The Danish international is an imposing presence on the court, a consistent goal scorer and is not afraid when it comes to stopping oncoming attackers. He is one of the world’s top line players and his presence on the line is always a boost for Kielce. He proved that last season with his nomination for World Handball Player of the Year 2012 and being named on the 2013 World Championship All-star team. He joined Kielce from Atlético Madrid during the summer for his first foreign league experience and has settled in well, despite dealing with a groin injury early on. This is the second stint of the robust Croatian in Veszprém, but in the 2004/05 season he did not have a chance to play, as he was injured in a car incident before his first match. The world champion and EHF EURO silver medallist came back to Veszprém after several years in Zagreb and Celje. Sulic is enjoying his best season in Europe, by reaching the VELUX EHF FINAL4 as well as being the competition’s highest scoring line player. Born in Novo Mesto and formed at Trimo Trebnje, the 24-year-old playmaker made an instant impact on the team of Slovenian champions, who lost several key players over the last summer. He took his maiden season in the Europe’s elite competition by storm and with 72 goals he still leads all centre-backs before the VELUX EHF FINAL4 even though Velenje were eliminated by PSG in the Last 16. The 26-year-old was awarded World Handball Player of the Year in 2011, the year he reached the VELUX EHF FINAL4 with AG Kobenhavn. He is the son of former Danish international Flemming Hansen. Having grown into a top class player at Danish side GOG, he has spells at Barcelona and AG Kobenhavn before joining PSG Handball at the start of the 2012/13 season. Hansen was PSG’s top scorer in the CL this season with 56 goals. The arrival of Pavel Atman was a massive transfer coup for Metalurg last summer. The 26-year-old Russian played for Kaustik Volgograd and Belarusian team Dinamo Minsk before signing a two-year contract with Metalurg. As a national team player for Russia he participated at the 2009 and 2013 World Championship as well as the EHF EURO 2012. Alongside orchestrating the Skopje attack this season, Atman found the net 47 times. Mads Mensah Larsen is considered one of Denmark´s brightest back court talents. He joined Aalborg in the summer of 2012. For previous club AG Kobenhavn, he mainly played at left back, but this meant reduced court time due to the presence of Mikkel Hansen. For parts of his time with AGK, Mensah was loaned out Nordsjælland Håndbold, but he has proven himself be a key player for Aalborg this season with 58 goals. This is the Serbian shooter’s second season at Kiel after he was brought in to fill the gap left by Kim Andersson’s departure to KIF. After an uneasy beginning, he grew into his role and the two-metre tall right back scored 76 goals, a mark he has already surpassed this season with 78. Vujin has won six consecutive national championships with Veszprém and Kiel and he is a stalwart of the Serbian national team. He is the only Metalurg player to have won a European Cup title to date as he was a Celje player when they won the EHF Champions League in 2004. The 38-year-old has been enjoying a second spring in his career and has produced his best scoring form in the VELUX EHF Champions League this season, finding the net 95 times, to lead the top scorers list ahead of the VELUX EHF FINAL4. Born in Latvia, he took over the Icelandic citizenship and became an Olympic silver medallist in 2008 and won EHF EURO 2010 bronze. He moved to Germany in 2003, playing for Düsseldorf, Großwallstadt, Flensburg-Handewitt, and Füchse Berlin, before he transferred to Löwen in 2012. Petersson scored 34 goals this season, despite suffering from a shoulder injury which required surgery early in the season. The powerful back court shooter from FYR Macedonia is the most successful scorer at a single EHF EURO event (2012 Serbia, 61 goals) and also at World Championship level (2009 Croatia, 92 goals). He was also top scorer of the EHF Champions League twice (2005/06 and 2007/08) – but this title is still missing in his trophy cabinet. He has been instrumental in Barca’s success this season, leading them in the CL with 71 goals. The Romanian Handballer of the Year in 2008 and two-time top scorer in Romania (2005, 2007), joined Wisla Plock in 2012 and during his first season showed his great goal scoring ability. Ghionea quickly became a very important Wisla player and his team’s top scorer. The right wing was among the top scorers early in the season, but a broken hand in November hampered his season, restricting him to 48 goals. The spectacular right wing returned to France last season from Spanish side Atletico Madrid and immediately showed how much progress he made. During his four seasons in Spain, he learned to channel his energy and reached the final of the EHF Champions League in 2011 and 2012. With his high jump and array of tricks, he scored 48 times this season, while sharing court time with Fahrudin Melic. Marguč has been with Celje since 2009. Last season was a breakthrough year for him, scoring 72 goals, including 18 from 18 shots against the legendary Thierry Omeyer in two games against THW Kiel. The 23-year-old improved on that tally to 79 this season and lies third in the overall top scorers ranking, despite the fact that he and his club Celje exited the competition in the Last 16 against Flensburg. He was born in Pforzheim, near Mannheim and moved to RNL as soon as he became a senior player. Groetzki played for all underage German national teams and was MVP and silver medallist at the Men’s 20 EHF EURO in 2008, before becoming junior world champion one year later. Like Gensheimer, Groetzki is a counter-attack specialist and enjoyed his highest goal scoring tally in Europe with 53 goals this season. Born in Barcelona, Viran Morros started his career with his current club before playing for three different ASOBAL teams. After clinching his fifth Spanish league title. The defence is his natural environment. After being nominated as best defender in the Spanish league in 2008 and in the EHF EURO in 2012, he was also in the running to be named best defender in last season’s All-star team. Schuch was a part of the national team of Hungary to reach the semi-finals at the London Olympics. The fact that Veszprem are consistently among the teams to concede the fewest goals is evidence of his work in organising the defence and he was awarded the best defender in last season’s VELUX EHF Champions League All-star team. Schuch even chipped in with four goals for his side in this season’s competition. At 28, Croatian Jakov Gojun has become a regular in the VELUX EHF Champions League. Formed in Zagreb, he then played for Atletico Madrid before arriving in Paris last summer. Helped by his compatriots Vori and Kopljar, he's polished his art to become a key element of the PSG defence. He is adept at reading pass trajectories, but he does not hesitate to use his body in order to make the game tougher for his opponents. Even at the age of 36, Lars Jorgensen is still being considered among the best defenders in the world. His enourmous international experience - with the national team and stints at Portland San Antonio and AG Kobenhavm - and his ability to read the game, together with his physical strength and his uncompromising approach have made him essential to KIF Kolding København since he joined the club in the late summer 2012.